With interactive notification, when a notification arrives, users can take actions without opening the application. When an interactive notification arrives, the device shows action buttons along with the notification message. Interactive notifications are supported on devices with iOS version 8 and above. If an interactive notification is sent to an iOS device with version earlier than 8, the notification actions are not displayed. Prepare the notification and send notification. For more information, see Sending push notifications. //Category identifier, this is used while sending the notification. //Optional array of actions to show the action buttons along with the message. //Action title to be displayed as part of the notification button. //Optional mode to run the action in foreground or background. 1-foreground. 0-background. Default is foreground. //Optional property to mark the action button in red color. Default is false. //Optional property to set if authentication is required or not before running the action. (Screen lock). //For foreground, this property is always true. //Optional list of actions that is needed to show in the case alert. //If it is not specified, then the first four actions will be shown. //Optional list of actions that is needed to show in the notification center, lock screen. //If it is not specified, then the first two actions will be shown. 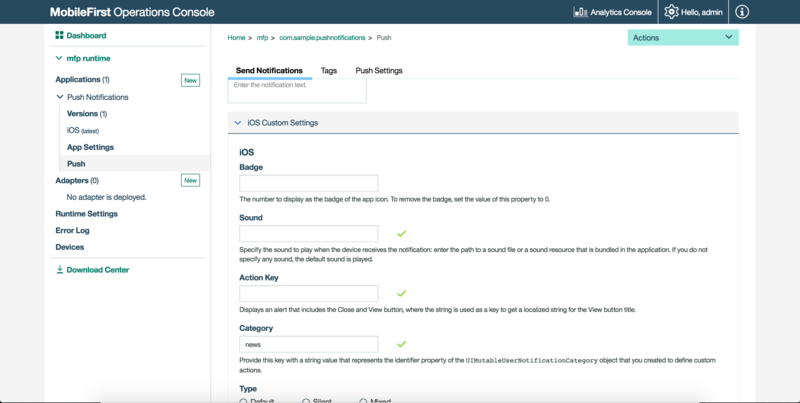 Pass the options object while registering device for push notifications. Enable the application capability to perform background tasks on receiving the remote notifications. This step is required if some of the actions are background-enabled. Define registered categories for interactive notifications and pass them as options to MFPPush.registerDevice.